You have to travel with the cash you want to exchange. This might reach into the thousands for even a short trip. You never know what kind of deal you’re getting on the exchange. For these reasons, we’ve learned to RARELY use currency exchanges. 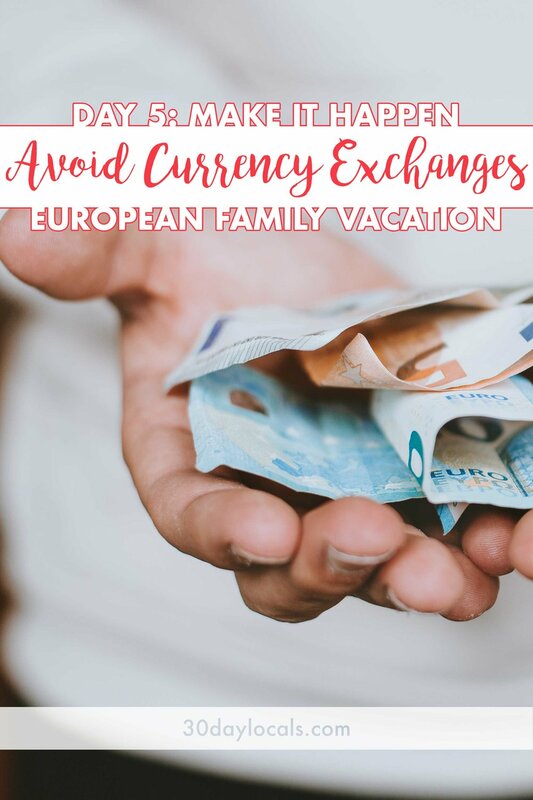 We recently returned from 5 months of traveling around Europe and only used a currency exchange once: when we had a little too much cash left over in Switzerland and knew we would not need Swiss Francs again. The secret to avoiding currency exchanges is in using a combination of the right bank account and credit cards with no foreign transaction fees. In this way, we’re able to travel from the U.S. to Europe while carrying essentially $0 in cash. When we arrive at our destination, we simply head to the nearest ATM (or the one with the shortest line), and grab some cash. When the machine displays the warning, “This ATM charges a 4.50 Euro fee for use. Continue?”, we can confidently answer, “Absolutely, no problem :)” And, because we’re not concerned about paying fees, we can get only the cash we think we’ll need for the next few days which helps with travel safety. By pulling cash straight from the ATM, you’ll get the best exchange rate your bank has negotiated with the ATM machine owner. Let’s look into each of these further starting with foreign transaction fees and why these are a problem. If you use a traditional credit card internationally, your statement will include a line item for these dubious “foreign transaction fees”. These are often a percentage of everything you purchased while abroad and can be as high as 5% of the total sum. Even debit cards will often have these fees associated with them so watch out. You’ve worked hard to save money for your trip and even set up a travel budget to make sure you get the most from your hard work. Why would you give the credit card company 5% off the top? This adds no value to your trip so do a little legwork a few months before you travel and get a card that does not charge fees when making a purchase overseas. For reference, it usually takes around 30,000 points for a one way economy-class ticket to Europe per person. The final reason we choose the Chase Sapphire card is because the points generated are flexible. You will receive Ultimate Rewards Points that are redeemable through the Ultimate Rewards Website. There you can get a 10% bonus on travel purchases when you redeem the points directly through the website. But, there is a better way to use points. The Ultimate Rewards website allows you to directly exchange points for airline miles, hotel rewards, etc. directly with the providers. We generally exchange our points with United Airlines, but other options are available. This lets you travel farther. For instance, if a one way ticket from Chicago to Munich costs $700, buying directly on Ultimate Rewards would cost you 63,000 points (700 dollars x 100 points per dollar x 10% savings = 63,000 points). By exchanging the points with United, you can often get the flight for 30,000 points. That’s a savings of 33,000 point (or another ticket)!! One additional tool we use when traveling is the XE Currency Exchange app. This gives us an idea of what the actual exchange rate is at any given time. That way we know what to expect when we get our credit card statement in the mail when we get home. Coming home to surprises (like not knowing what exchange rate to expect) can leave a bitter taste and not how we like to remember our amazing travels. This also makes it easy to calculate how much a meal, entrance tickets, or a souvenir actual costs in the currency we are used to. Using these simple tools, we have avoided using currency exchanges, ensured we’ve gotten the best exchange rates available, and booked flights using miles. It’s so much better than the days of traveling with traveler’s checks (yes, we did that one time on our very first international trip) and we love not having to worry about if we are getting the best value for our money. Don’t forget to check out the other days in our 31 days to make your family vacation to Europe happen series. Be sure to pin this for reference later or to help out other families planning their next vacation. Get Ready to Take Your Family Vacation! We want to send you our best freebies! Start planning and make your dreams of a family vacation a reality. Thank you! Please check your email for access to your free travel planning tools from 30 Day Locals.